Custom Views provides powerful features that lets you customize exactly what information you wish to view on the screen. Custom views are laid out in a columnar format. In other words, each row consists of a player, and each column displays information about the player. You can create any number of view layouts. 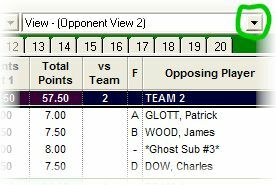 A custom view lets you determine how you want to view information on your “League Sheet” screen. To load, create, edit, or delete a custom view, pull down the View menu and select Custom Views, click , or simply drop the view box. Just like reports, views can be printed or exported at any time. Click the print button to print or export. Tip: Feel free to experiment. Any view you create can be altered or deleted at any time. There are several sample views that you can use. Feel free to load them to see what information they display on the screen. Also feel free to edit these layouts. They will give you a good idea of how views are created.